When you were a kid, your dentist would simply pull a tooth that was diseased. As an adult, you don’t have the luxury of regrowing a new tooth if yours are infected. To save diseased and damaged teeth, dentists will perform an endodontic treatment known as a root canal. 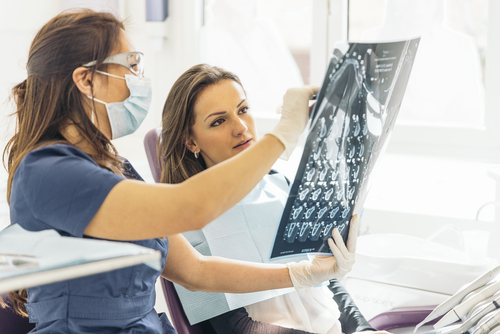 A root canal relieves the pain and discomfort of diseased teeth by cleaning out and disinfecting the roots, pulp, and other affected areas of the tooth. This procedure can be completed in as little as two or three visits, in most cases. Exposed dental pulp is likely to become infected as it is open to bacteria when you eat or drink. If you’ve suffered a cracked or chipped tooth or have a deep cavity or filling, you may be at high risk for an infection and should contact our dentists near Springfield and Ardmore as soon as possible. If left unchecked, a tooth in need can end up needing costly emergency dental care. If you are experiencing severe tooth pain and don’t get it examined immediately, it is more than likely you will need a root canal. When you come in for the procedure, your dentist at AmeriDENTAL Group in Upper Darby will discuss treatment before he or she begins. First, the dentist will numb the area to be treated, initially with a topical numbing gel and then with an injection of a local anesthetic. Next, he or she will dry the area completely before making an opening to expose the infected pulp. With the pulp exposed, your dentist will remove the nerve and clean the canal by administering bacteria-killing medicine into the root. If the infection is severe enough, you may need to take antibiotics to rid the roots of the infection. When the canal is totally free of bacteria and moisture, the dentist will seal the canal with gutta-percha, a rubber-like material before filling in the cavity. Finally, the dentist will use a temporary crown to cover the tooth until a permanent crown is made, which can take a week or two. When you return for your next visit, no pain medication is needed to remove the temporary crown and install the permanent crown, which takes no more than about 20 minutes. Our team of friendly dentists and dental assistants are always happy to answer any questions you may have, so don’t hesitate to give us a call! When it comes to severe tooth discomfort, you should act quickly before the pain becomes unbearable and irreparable damage is done. To schedule an appointment near Springfield and Ardmore today for an examination, teeth cleaning, or other dental treatment including wisdom teeth removal, give us a call at 484-971-6351.